Readers visiting Bordeaux will want to set aside at least one night for L’Univerre. The wine list will leave even the most seasoned traveler drooling, while the food is absolutely delicious. Set in the center of Bordeaux, L’Univerre is an updated, modern version of the classic French winebar/bistro. The ambience is casual, unpretentious and welcoming. Zalto glasses and an extraordinary attention to detail are but two elements that elevate the experience at L’Univerre. Proprietor Fabrice Moisan curates an extraordinary wine list full of hard to find jewels from all over the world. The list includes a number of older wines that are virtually impossible to find today, plus a fabulous selection of current releases, all at prices that will leave diners wondering when they can come back for another meal. Most of the emphasis is on Burgundy and the Rhône, although there are plenty of compelling wines from other regions. The food is simple and impeccably prepared, with pure flavors that really allow wines to shine. 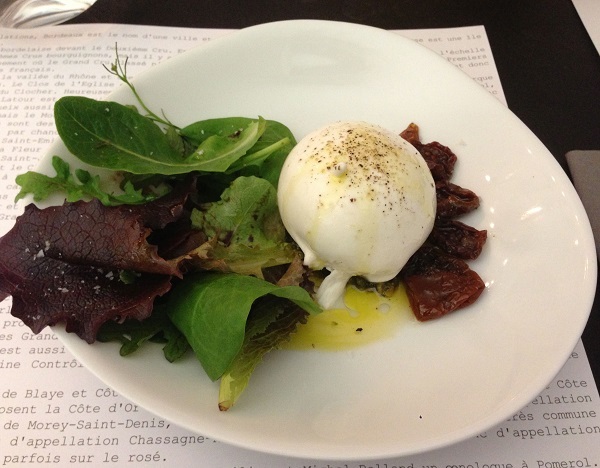 L’Univerre’s Mozzarella, sun-dried tomatoes, mesclun salad is hardly typical Bordelais fare, but it is quite delicious and a welcome change after two weeks of eating the richer food that is typical here. 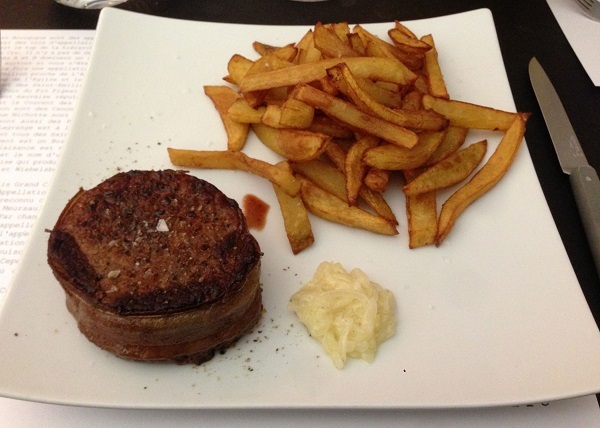 The roasted beef tenderloin wrapped in bacon, French fries is a classic. Cooked perfectly, the beef is simply superb. We fare pretty well with wine, too. The Comte Liger-Belair wines are virtually impossible to find, so I never miss an opportunity to drink them when I see them. 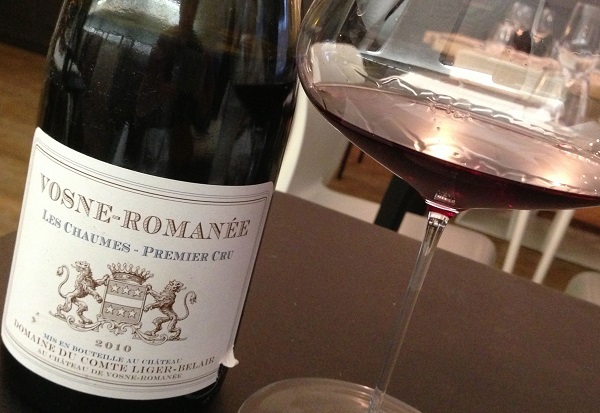 The 2010 Vosne Romanée Les Chaumes is simply dazzling in the glass. Beams of underlying minerality and acidity lend support to the brilliant, chiseled fruit. This is the first vintage of the Chaumes to incorporate whole clusters, which seem to give the wine a level of aromatic lift, salinity and pure energy that cut through the richness of the beef beautifully. Today, the Chaumes is even better than it was a year ago. Of course, the 2010 is far too young to offer its best drinking, but it is stunning just the same. Readers spending time in Bordeaux will not want to miss L’Univerre. The setting might be informal, but don’t be fooled. The food and wine is just as delicious, if not better, than what visitors will find in some of the region’s fancier establishments.